Possible Money In The Bank 2017 Spoiler - Is WWE Getting A Miracle Tonight? 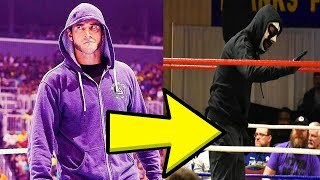 Is WWE getting a Miracle? Rumors of Mike Bennett and Maria joining WWE have been heating up over the past few months. It looks like tonight might be the night they finally debut. The duo has apparently been spotted at an airport in St. Louis, which is where Money in the Bank is taking place. One can only guess what they'll do if they debut on the show but there is certainly a lot of possibilities. Bennett could get involved in the Money in the Bank men's match and cost someone like Nakamura or A.J. Styles the briefcase, thereby setting off a big feud right out of the game. Maybe they'll join forces with Zack Ryder and give Mojo Rawley an epic beatdown on the pre-show. The couple could also simply cut a promo and state their arrival. No matter what, this is exciting news for the blue brand. With ratings taking a hit lately, the show desperately needs some new faces to create a buzz. Bennett and Maria did some entertaining work on Impact last year and will likely adapt well in WWE. Hopefully this rumor is true.